Did any of you find Pool Pool under your Christmas tree this morning? Alas, no one did. I was poised to make a lot of money off that toy until a certain mohawked celebrity got in my way. Anyone who blogs (you know who you are, don’t deny it) knows that there is precious little money in blogging. See those ads on the side and top of my blog? Haven’t seen a check yet. But that doesn’t mean that I don’t need to make money. Sure, people think of blogging as a glamorous and ritzy occupation but in reality we need real jobs. Now while I work at the unnamed for security reasons Company which I Am Employed by, I still need to supplement my income. A few years back I dove into the world of toys and invented a product which I promoted heavily here on bmj2k.com. From 2008, here are three Classic Reposts. Plus, as a bonus, I’ll update you on the success of my new venture as well. Hi all. I haven’t had time to blog much lately because I’ve been spending all my time in the research labs perfecting a new game I’ve developed. I hope it will become as big as Monopoly or Hungry Hungry Hippos. It is currently ready for beta-testing. I call it POOL POOL. It is an inflatable billiards game you play in the swimming pool. I nearly have all the bugs worked out. The only flaw is that the chalk keeps clogging the pool filter but I am working on it. The work is going smoothly. I decided to continue my efforts in the field of swimming pool games despite the mistake I made, the tragic mistake, in my understanding of the rules of water polo. I have settled most of the lawsuits, but I still have PETA and NYRA on my back. I hope to have POOL POOL in stores in time for the big Christmas swimming pool season. It will make a great stocking stuffer. Work on POOL POOL is moving ahead nicely. It is projected to be the most demanded toy of the 2008 Christmas pool season! In recent weeks I have made advances to improve the playability. In addition to solving the clogged filter issue, I am pleased to announce a celebrity endorsement which will further enhance the POOL POOL experience. Mr. T’s “I Pity the Fool POOL POOL”™ can be played in any outdoor or indoor swimming pool. Don’t have a pool? You can play Mr. T’s “I Pity the Fool POOL POOL”™ in your bathtub! I proudly expect further exciting news in the weeks to come! Yes, just in time for the big Christmas/Hanukkah pool toy rush, my new hit gift MR. T’S “I PITY THE FOOL POOL POOL”™ is now in stock at all fine toy retailers and pool supply warehouses. FOR A LIMITED TIME ONLY, fans can get a GENUINE LIMITED EDITION SIGNED AND NUMBERED LITHOGRAPH with your purchase! The first 950,000 sets of MR. T’S “I PITY THE FOOL POOL POOL”™ come with an exclusive lithograph of Mr. T himself knocking an opponent into the I PITY THE FOOL SPLASH ZONE with his own MR. T PITYER, sold separately. The lithograph was designed by the craftsmen at Zebenco Industries, who previously made the limited edition Ron Popeil Pocket Fisherman lithograph. 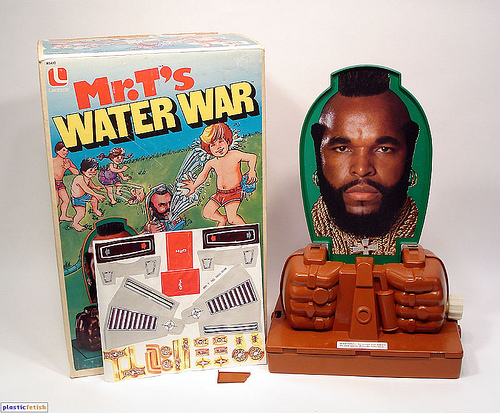 I’m sorry to say that not only did Pool Pool not make me rich, I was later sued by Mr. T, who ended up owning the rights to both Pool Pool and my follow-up invention, Water Wars. My only consolation is that in 2009 I was able to get a court order to Stop Mr. T from blogging under the site name Mr. T’s T-Pid Ride.